Huntington Beach, Calif. - According to my sources it was a great meet. Many thanks to Brian Tinkler plus Debbie and Tom Hopkins for taking over the duties and running the meet while I off volunteering for the Acura Grand Prix of Long Beach. I'm sorry to have missed the meet. 97 people showed up and we had some very rare and interesting bikes. Formerly "Vintage Bike Night" we now meet during the day to give our 6 Volt lighting systems a break. 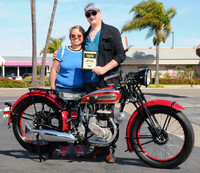 We're a group of people who own, ride, and love vintage motorcycles. We meet on the second Sunday of every month in Surf City Huntington Beach, California. 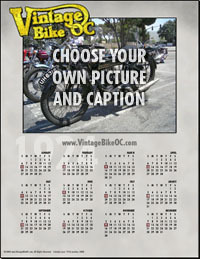 Stay up to date with email reminders of our meets, and other events in the Orange County area.